Kids are back in school and you know what that means? My kitchen is now school lunch central in the morning! 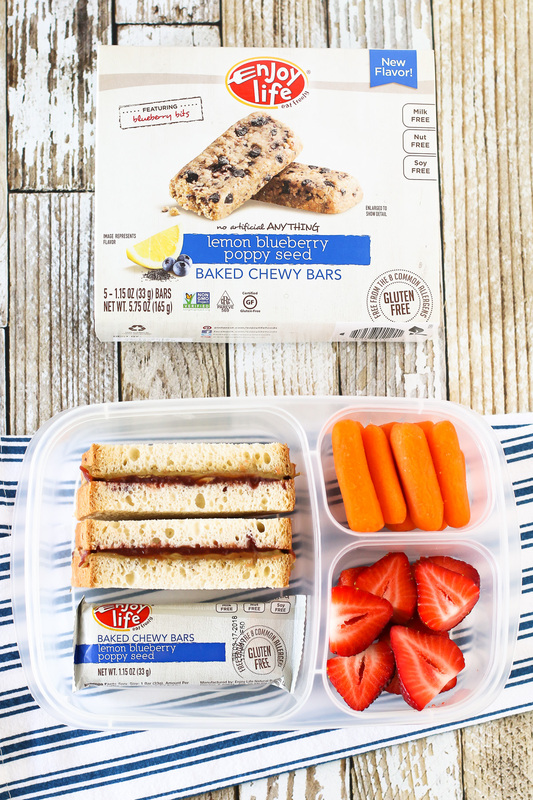 I’m sharing 3 easy allergen free lunches, featuring the new Enjoy Life Baked Chewy Bars. Packing lunches for 4 kids is no joke. Sometimes I run out of ideas as to what to pack them for them. That’s why I love brands like Enjoy Life. They make some of the tastiest allergen free snacks and treats. Perfect for packing in school lunches! Enjoy Life recently released 3 NEW flavors of their Baked Chewy Bars. Caramel Blondie, Lemon Blueberry Poppyseed and Carrot. 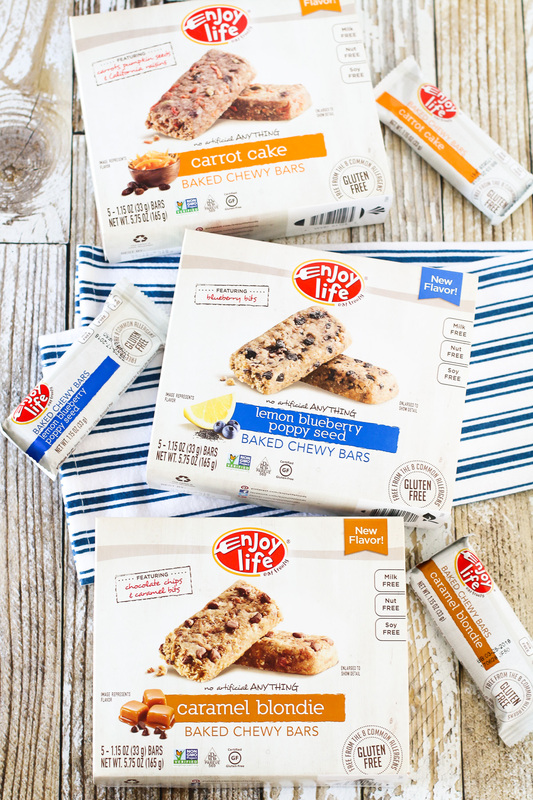 Not only are these bars top 8 allergen free, they are made with their Pure Life Dry Balanced Blend, which contains cassava, sorghum and quinoa. I adore the Lemon Blueberry Poppyseed because I love all things lemon. Every flavor is delicious! If your local grocery store doesn’t yet carry the new Chewy Bars, don’t worry! You can receive 20% off your order of single boxes by using the code CHEWYBLOG over at enjoylifefoods.com. The code is good thru September 15. I’m also hosting a giveaway of the bars over on my instragram. You can win a box of each of the new flavors. Now, as much as every school lunch needs a treat, they also need something salty. 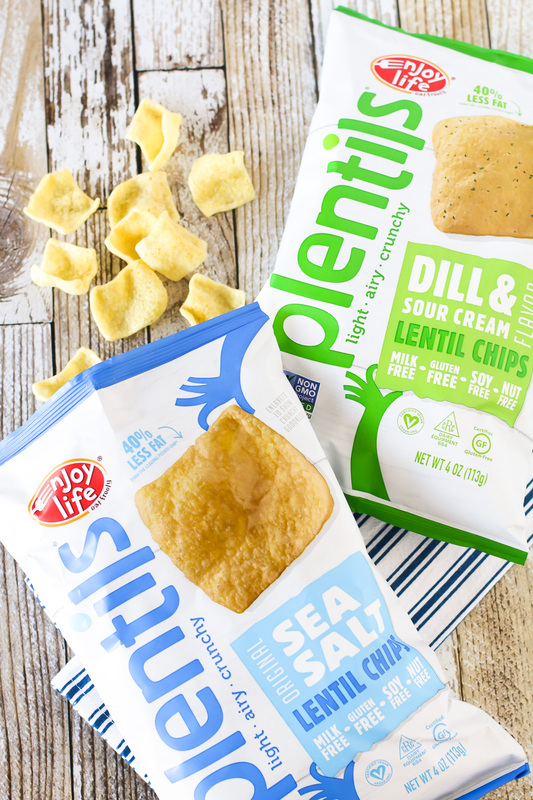 I’ve included some Enjoy Life Plentils in each school lunch idea as well. They are a family favorite and seriously so addicting. A crispy, salty and oh so crunchy snack. These turkey, spinach and guacamole pinwheels are so tasty and couldn’t be easier. It’s always a good idea to add a little green to your lunch! 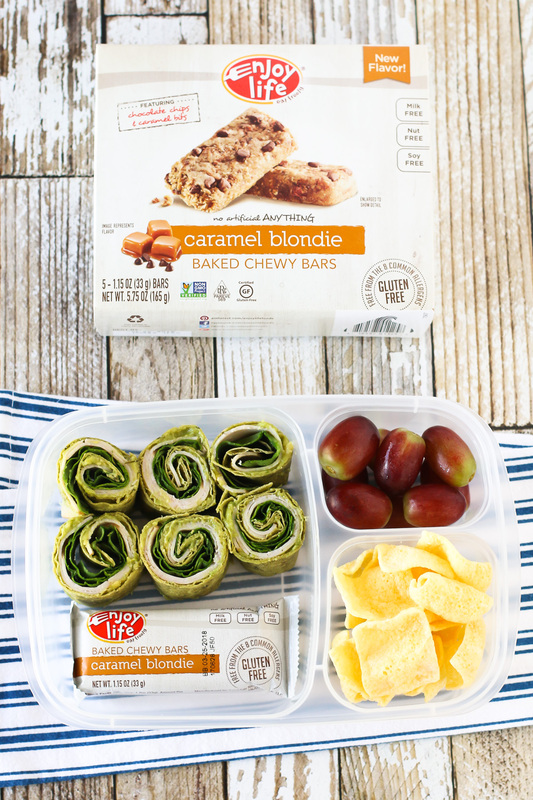 Serve with grapes, Plentils and a Caramel Blondie Chewy Bar. Spread guacamole on tortilla. Layer slices of turkey lunch meat down center of tortilla. Top with spinach leaves. Tightly roll tortilla and slice into pinwheels. Refrigerate or keep chilled until ready to eat. The classic PB & J, only allergen free! Made on gluten free bread with sunflower seed butter and your favorite jelly. Sliced banana would be yummy too. 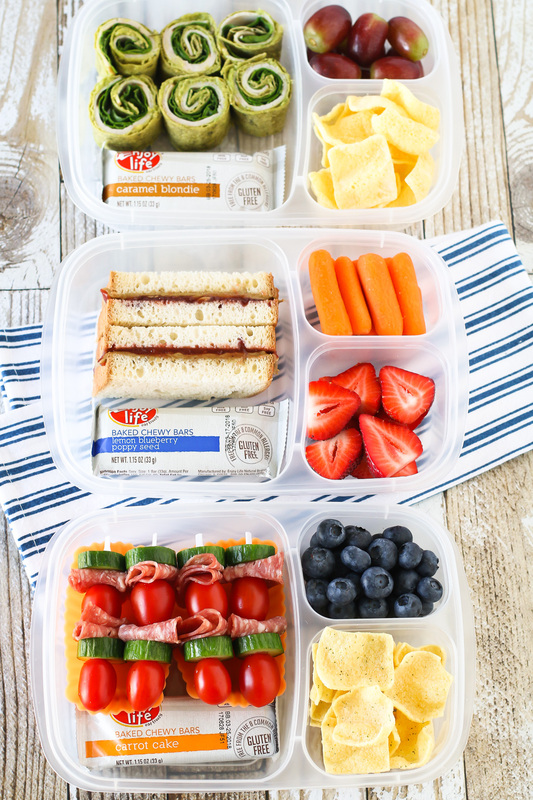 Cut sandwiches into strips, making them a fun way to eat! 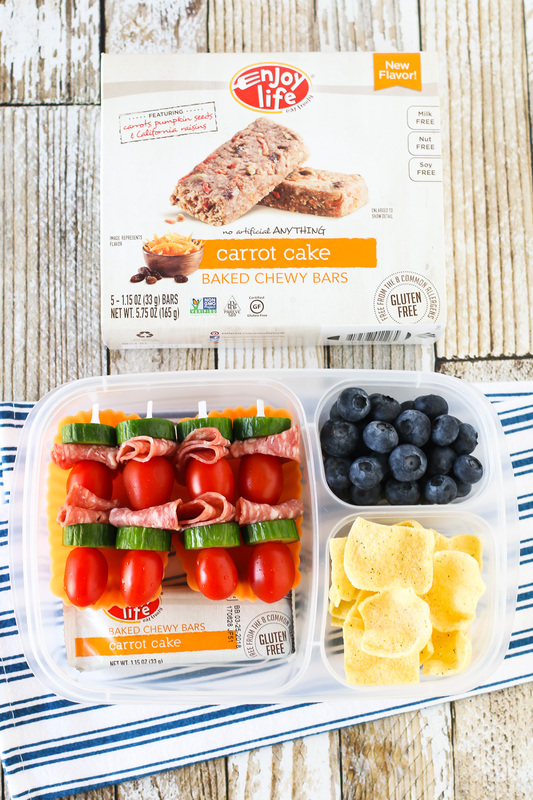 Served with baby carrots, strawberries and a Lemon Blueberry Poppy Seed Chewy Bar. Spread sunflower seed butter onto slice of bread. Spread jelly on separate slice of bread and place both pieces of bread together. Cut sandwich into strips. Mixing it up with these tomato, cucumber and salami skewers! I’m thinking they would be pretty tasty dipped into your favorite hummus. Served with fresh blueberries, Plentils and a Carrot Cake Chewy Bar. Sprinkle sea salt onto sliced cucumbers. Place cherry tomatoes and cucumbers onto skewers. Fold salami slices and place on skewers. Repeat. Refrigerate or keep chilled until ready to eat. Wow. Gorgeous post full of such yummy ideas 🙂 Thank you for making my humble food containers look so stunning Sarah! Just wondering what brand your spinach wraps are?? I haven’t seen flavored wraps and would love to get my grocery store to get them! They are Rudi’s and I found them at Sprout’s! You should be able to find them at Whole Foods too. Have you tried Simple Mill crackers? They are awesome! Be careful. A whole box can be consumed in one sitting! I LOVE Simple Mills crackers!! and yes, they are totally addicting!